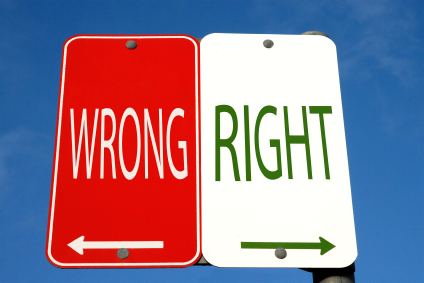 Right vs Wrong | stories and etc. Sometimes you know you are right about something and the other person is wrong. And sometimes the pride (or principle) of being right will get you in “trouble”. You can be right, but at what cost? A business has a client and sells a product to a regular customer. During one order, it seemed that the customer made a mistake and ordered the wrong item. The one could not be returned because of the company’s policy and the inability to re-sell the item. The company is fairly certain that the customer made a mistake while the customer is adamant that he did not. If you stand your ground, you may lose the customer. If you don’t, he may exploit your “softness” in future business transactions. What do you do? Is it a simple matter of the classic saying: the customer is always right? Does the company need to stand its ground to not appear soft, even at the cost of the customer? Or is it a simple matter of determining how important the customer is and let the customer be “right”? Two good friends have a fight (we’ll call them Rachel and Olivia). Olivia accuses Rachel of being something that Rachel really isn’t. Rachel is very mad at Olivia and knows that Olivia was very out of line. However, historically Olivia has been very stubborn. Rachel thinks that if she doesn’t talk to Olivia and apologize/meet her halfway, that Olivia may not apologize at all and it could leave their friendship in ruins. It’s not just about being right Rachel says, it’s the principal in the matter. What do you do? Should Rachel speak up first or simply wait it out till Olivia apologizes? If she doesn’t, is it worth losing the friendship? Story #2 = story of my life with several people. I have to end up apologizing or trying to rekindle the friendship. After all those years dealing with people like that, I realize I now tend to give up. After making up, the situation is bound to happen again. It takes a real emotional toll… So in the end, I ask myself: Is the friendship even worth it?